With Old Glory leading the way, hundreds of people crowded onto Main Street Tuesday night for Fountain Green's first Christmas light parade, organized especially for little Addie Fausett. 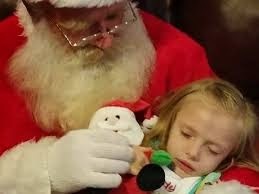 The 6-year-old girl with a terminal brain disease enjoyed the festivities with her mother and sisters — the culmination of a month of love, showered on her family, that has touched everyone in the community. "I think it has changed the way people think about Christmas in this little town,” said resident Nathan Beck. Beck and his family made two floats for the parade. “It has kind of restored my faith in humanity, to see so many people pull together with this tiny little girl and this tiny little town,” Beck said. While their floats are nothing fancy, they were made with tender loving care. As the special guest of honor, Addie watched the parade in front of the post office, where over the past month, nearly 300,000 Christmas cards, letters and even gifts have arrived for her from places near and far. The community has stepped in to help open them all. The majority of the toys have been shared with local charities to help other families in need this Christmas. And with feelings of gratitude, Addie's mom became emotional Tuesday night, seeing so many people brave the cold to support the parade. "I think it is really awesome that so many people want to come and do this, and so many people showed up to watch as well,” Tami Fausett said. Overwhelmed with generosity that has been felt from around the world, Addie's family says they have everyone to thank for helping make memories from this Christmas that will last forever. Addie stopped growing when she was 3 years old, and slowly since then, the bubbly and energetic little girl, who now weighs just 23 pounds, continues to struggle. Even with many visits to neurologists at Primary Children’s Hospital, Addie’s condition remains undiagnosed. Doctors have told the family Addie may live roughly a year, her mother said. My prayers go out to this family and especially Addie.